The ITV cameras are at Newmarket on Friday afternoon for day two of the Cambridgeshire meeting and the opening listed Rosemary Stakes for fillies and mare over the Rowley Mile is a tricky puzzle to solve. Laugh Aloud failed to build on her belated Sandown reappearance when disappointing at Doncaster last time and she is overlooked despite the fact that this represents a drop in grade and she won the corresponding race two years ago. Royal Ascot winner Agrotera was a bitter disappointment behind Unforgettable Filly at Haydock on her penultimate start but bounced back at Paris Longchamp when runner up to Charlie Appleby’s Poetic Charm. Ed Walker’s three-year-old – 3/1 at BetVictor - receives weight from the other principles and I will be disappointed if she doesn’t go very close. The Nayef Stakes has been won by the classic generation eight times over the last decade and in a modest looking renewal I hope Jamie Spencer – who also rides Agrotera – can land the spoils courtesy of Mrs Sippy (2.25) who is drawn next to the far rail in stall one. David Simcock’s filly scored in listed company at Longchamp last time and is open to further improvement after just the six career starts. She is 4/1 with BetVictor and receives a valuable 7lbs from Star Rock who might find the drying ground a concern. When Sun Maiden won at Salisbury on her seasonal reappearance she looked potentially top-class, but she has failed to build on that effort. Sir Michael Stoute has won this race twice with three-year-old fillies in the last 10 years, but I favour Mrs Sippy although the latter is rated 4lbs inferior on official figures with the Stoute-runner. Mushtashry (3.35) did us a favour when winning at Doncaster earlier in the month over 7f and today’s additional furlong will certainly suit the five-year-old although his 3lbs penalty for that success is a slight concern. Jim Crowley made plenty of use of his mount at Doncaster last time but was going away at the line and I feel he can get the better of Queen Anne winner Accidental Agent (carries a 5lbs penalty) and Zabeel Prince who has a history of going well fresh and returns from a break but may need rain to be seen at his very best. The big betting race of the day is the Silver Cambridgeshire and my two against the field are History Writer (7/1 at BetVictor) and Almoreb (5.15) with marginal preference for the Richard Hannon four-year-old (8/1 with BetrVictor) who may have found the combination of good to soft ground and ten furlongs just taxing his stamina last time. This 9f trip should be ideal. At Haydock, Hazarafan (1.35) would not want the ground (described as good to soft) to dry out too much and it is perhaps significant that Ed Dunlop takes off the tongue-tie that his three-year-old raced in last time. In the circumstances I felt he ran a cracker given he was too free and failed to get home over an additional quarter mile and today’s conditions should be ideal. The selection has been dropped 2lbs since that run at Nottingham and this maiden son of Frankel looks potentially well treated. He is an each way recommendation. I’m looking forward to the Novice Chase at Worcester with Treackle Tart, dual winning pointer Station Master and Arctic Gold (2.50) in action and preference for the Nigel Twiston-Davies runner is marginal given he didn’t look the most natural of jumpers last season but remains a novice of some potential. I am a big fan of Truckers Lodge (5.05) who won his last start for Tom George back in the spring and has joined the stable of Paul Nicholls for his seasonal reappearance. 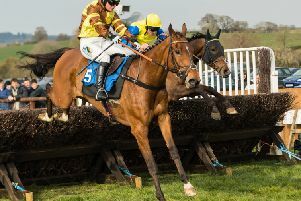 This is a decent novice for the time of year, but I am sure the selection needs decent ground and Harry Cobden has his first ride for the best part of four months. It is great to have him back – and I hope with a winner.